Philippines Macho Academy and Princess Studies, the works of Eisa Jocson's, mirror the entwined relations between dancing, physical labor and desire consumption. 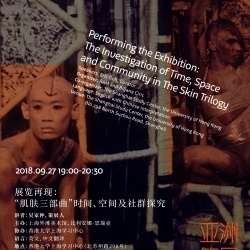 Physical sensation and structural contradiction will be the two main topics of this talk, during which the following questions will be discussed: How does a body present or become a performance of desire? How does such desire change the trading and power relations between the audience and the performer? For the third talk in a series related to “Second Assembly: Exhibition-Making Practice in China and Southeast Asia in the 1990s”, a curatorial project jointly curated by Biljana Ciric and the museum, RAM is delighted to invite Kuala Lumpur-based curator and writer Eric Goh to discuss the 1995 exhibition Skin Trilogy by the Malaysian arts collective Five Arts Centre.